I’d like to think that I’ve become much more of a minimalist over the years, and that’s why I was able to pack only a backpack’s worth of stuff for 4 days in Denver, but honestly, it has a little more to do with the fractured epicondyle on my left humerus. I really wouldn’t have been able to lift a roller bag into an overhead bin by myself, and I try to avoid checking bags if at all possible. (Especially after my gate checked bag got lost on the way to Vegas in February.) It made for much easier traveling though, and I even got to board the plane earlier, so I’ll probably try to do this for short trips in the future! I flew Fronteir Air, whom I’d never flown with before. I had a light dinner consisting of a Mediterranean snack box (similar to Alaska Air’s offering) that turned out to be all vegan. It included bruschetta, hummus, pita chips, seasoned olives, dried cranberries, almonds and cookies. 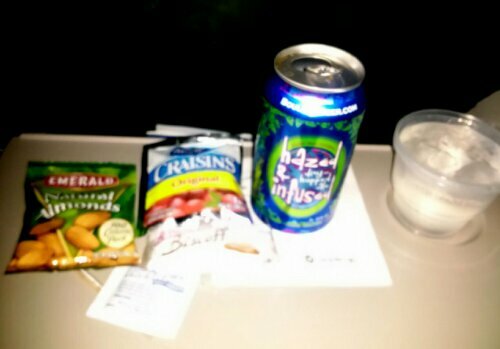 I chose a Colorado brewed Hazed & Infused to sip on while I nibbled for the 2 hour flight. 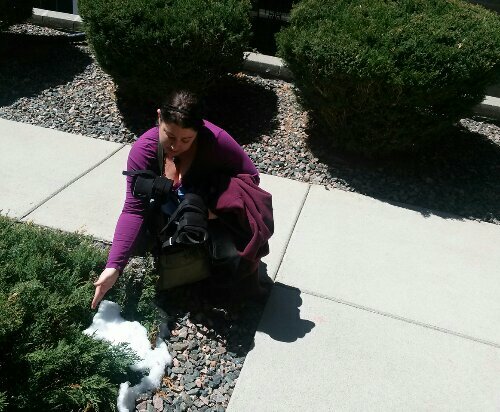 Here’s Joanna displaying what’s left of their last snowstorm. She’s only been in Denver for a month, so she was excited that I came so we could do some exploring together. She also decided she was going to eat vegan with me the whole trip. She’s done vegan cleanses before and felt great on them, so she’s no stranger to what it’s all about. (Though I warned her that I was on vacation, so it wasn’t going to necessarily be health food on my part!) She’s been trying to avoid dairy, gluten and soy anyway, so I’m trying to encourage her to feel good ALL the time, and make a plant based diet a more permanent change. 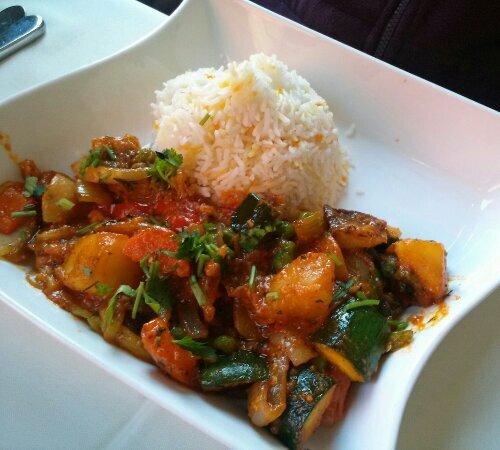 Jojo got a spicy Vegetable Medly Kadai, and we ordered some roti bread minus the butter, to go with our little feast. Best part? 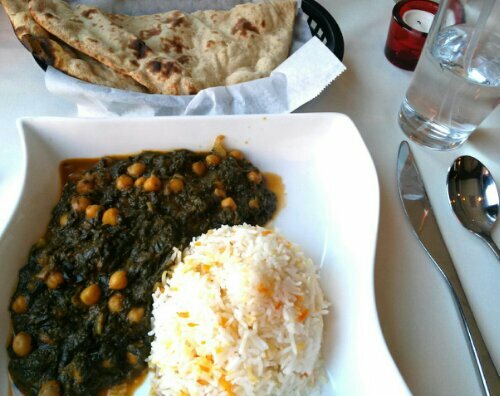 Even though it looks like a fancy place, with cloth napkins, excellent service and super good food, the whole bill was under 20 bucks! After this we walked around a bit and I saw Joanna’s new work digs. Then I went and had a fantastic massage with Mallory Asti. It included much needed work on my upper body, full massage, and reflexology and energy work for my injured arm. She has an extra low introductory rate for new clients, so if you’re in the area, I highly recommend you check her out! 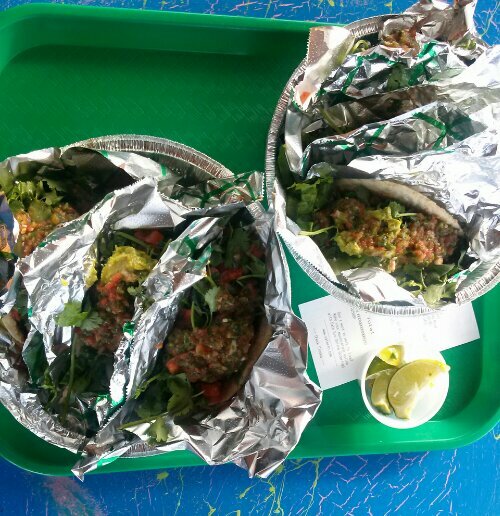 and we loaded them with lots of green yumminess like lettuce, cilantro, guacamole and some pico and hot sauce for good measure. Another meal for under $10 per person. 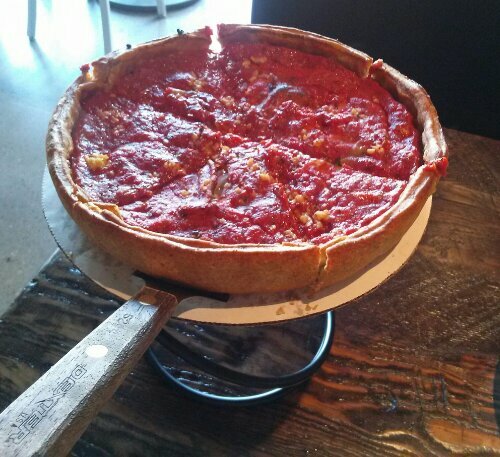 That night, before bed I was on Happy Cow and found a local (CO & CA) pizza chain, Patxi’s Pizza that made VEGAN DEEP DISH pizza! I was so excited, I could hardly get to sleep. I hadn’t had deep dish pizza in at least 12 years. When Joanna called me on her way home from work, I quickly explained all about it and called in our order so it’d be cooking while we were on our way. (Deep dish takes 35-40 minutes). We started with a greek salad (no feta! ), no dressing. 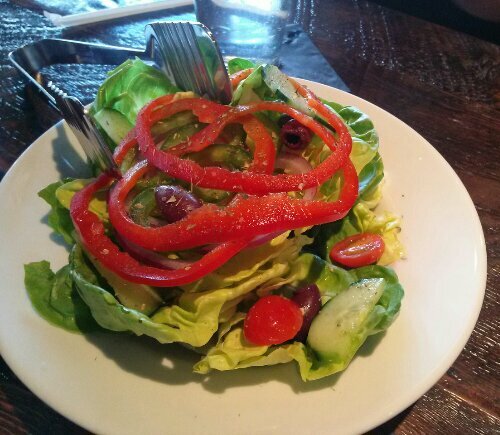 (The waiter said the dressing was vegan “except for the little bit of anchovy”, and Joanna promptly told him that it was not vegan then. Hah!) I splashed it with some of the red wine vinegar he brought to the table. Nothing to write home about here, just wanted to get some fresh veggies in before the pizza. The pizza was FANTASTIC. I ordered it right off the menu, no adjustments. 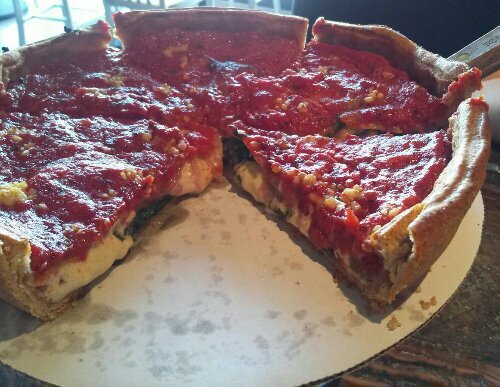 Authentic Chicago “Stuffed” Our flagship pie. A deep dish pizza with a layer of crust on the bottom, followed by toppings and cheese, all covered by another thin layer of dough, and topped with our homemade sauce. Also available in whole wheat dough. Prepared and cooked in a deep dish pan. 35-40 minute cook time. Seriously recommend you try this if you’re near any of their locations in California or Colorado! Come dinner we had the extreme pleasure of finally (in my case!) meeting Amber of Monk and Mao. She moved to Seattle right before we did, but unfortunately (for me!) they moved back to her hometown of Denver before we ever got to meet up! So yah, totally one of those moments where you meet someone and instantly bond. The lighting was a little tricky, so sorry about the picture quality there! The seitan wings are a huge portion! 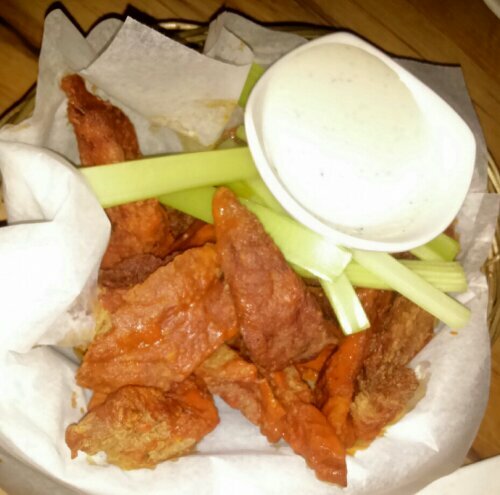 I didn’t really care too much about the ranch dressing, which I found reminiscent of soy milk, but the wings themselves were really good. 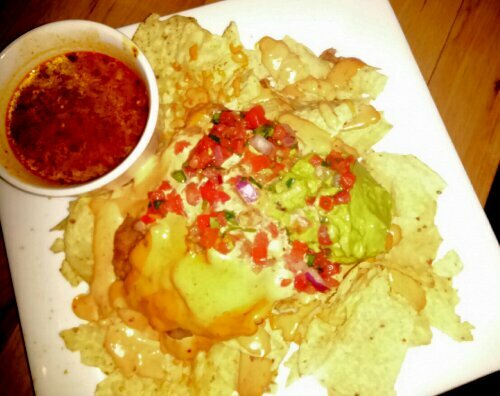 Our nachos were delicious, but Amber nailed it when she said it was the “bottom of the bag” nachos. Almost all of our chips were in tiny little pieces, so that at the end I was just eating them with a fork. I’m not really complaining about that though, because it was heavy on the refried beans, and I love me some refried beans, eaten by fork or hand. 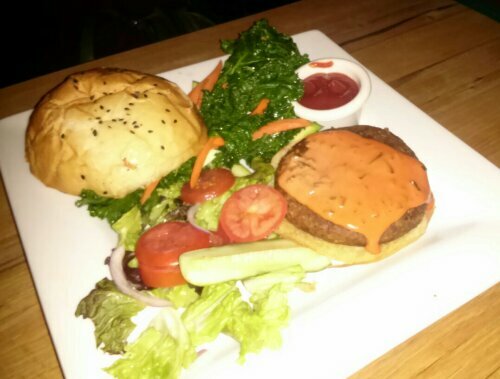 Joanna had the THE MAXIMUS BURGER – Homemade pinto bean and quinoa burger served on our kaiser roll and topped with lettuce, tomato, red onion and special sauce, with some steamed kale that I made disappear at the end of our meal. (Yes, I will eat your kale. You don’t have to ask me twice.) I also got to sneak a taste of the burger patty and it was pretty darn good. The nice thing about Watercourse, as explained to us by the server, is that everything on the menu is vegan unless it says it has a cheese option. And Amber says they’ll usually confirm with you about if you’re sure you want dairy cheese when ordering those. So needless to say, this is one of her frequent haunts. We all had such a great time! 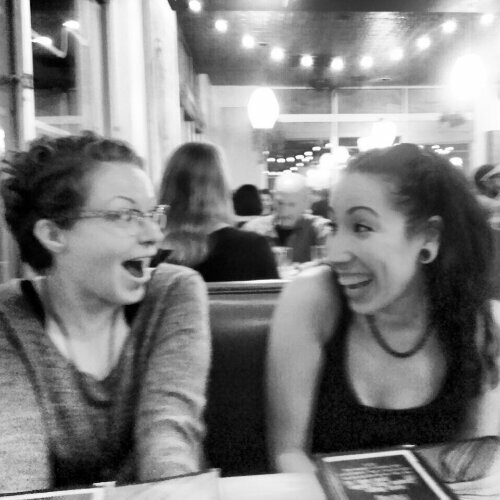 Joanna made a new vegan friend in Denver, and Amber and I chatted until Joanna practically dragged me to the car! 🙂 Hahaha! Thanks Jenna for remembering that this is where she lived, and providing the catalyst for our meeting. I had totally forgotten that’s where she moved! 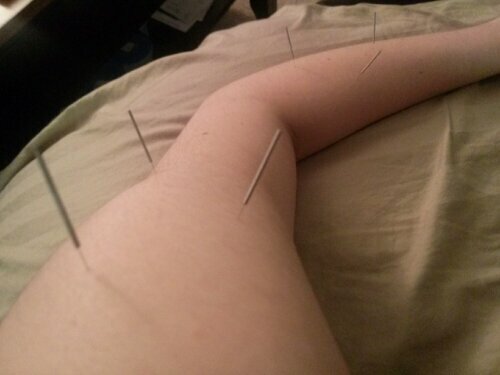 I was lucky enough to get some acupuncture from Joanna for my injured arm Saturday morning. She’s a talented little lady if you have any acupuncture/body talk/Reiki needs in Denver. You can find her over at the Om Flow! Then I hit the leftovers for breakfast. ; ) It was super hot outside by mid day, and even though it was only 67, my weather app said it felt like 77. And that it did. So we did the only logical thing to do… we hit the ice cream shop. 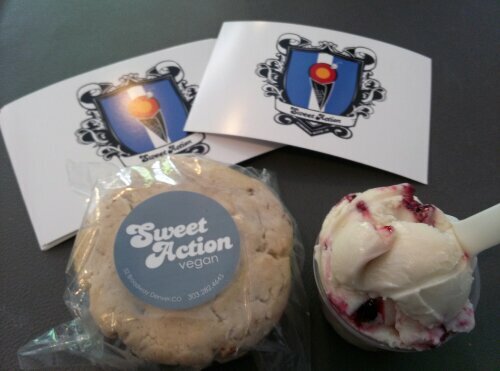 Sweet Action is a regular ice cream shop with vegan options. And man, everyone I talked to loved this place! Seems like they carry at least 2 vegan flavors per day. This particular day they had cinnamon roll & boysenberry swirl. Surprisingly enough, the boysenberry won out in my personal taste test. It was like a yummy, frozen berry cheesecake in a cup! Heavenly! 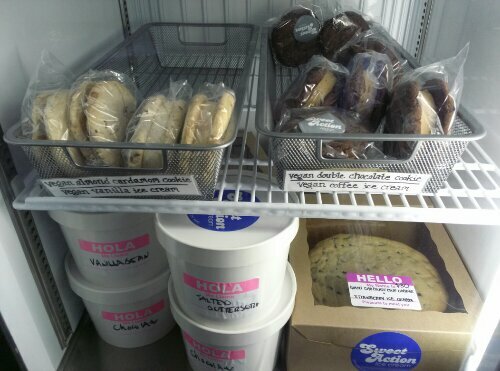 They also regularly carry pre-packaged ice cream sandwiches, and this day, they had two varieties. They had double chocolate cookies with coffee ice cream, and Joanna got the almond cardamom cookies with vanilla. That sucker was huge! I ate all of mine and made a concerted effort to finish hers until she shut me down. (She literally took it away from me.) I had to admit, I had probably eaten enough sugar anyway. The cookie was nicely spiced, and the vanilla ice cream, well, it was a little vanilla in comparison. I think the chocolate/coffee combo would probably have been tastier. I’m not a huge sweet tooth, but there’s something very satisfying about eating ice cream on a hot day, with the windows open. We walked around a little and I found a cute second hand dress and a pair of vintage looking shades. Then we had to head home to get me ready for the airport. 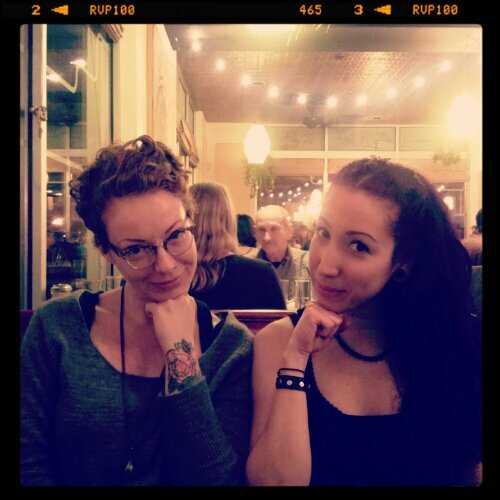 I felt a bit bad that I didn’t go to healthier vegan places with Jo, and dragged her down a path of vegan junk food with me, but she insisted that it was still superior. 🙂 It was a great little holistic get away for me too, and I always love a little quality time with my bestie. Thanks Jojo!! So if there are any places you think I missed out on, please comment below as I’ll probably be out to visit my Denver ladies again. The only other place I was curious about trying was Sputnik, which is attached to a music venue. We passed it on Thursday night, and they had a punk rock show going. They have a small vegan menu in addition to their regular bar food. Next trip for me is going to be next month, Memorial Day weekend for Vida Vegan Con in Portland (a.k.a. 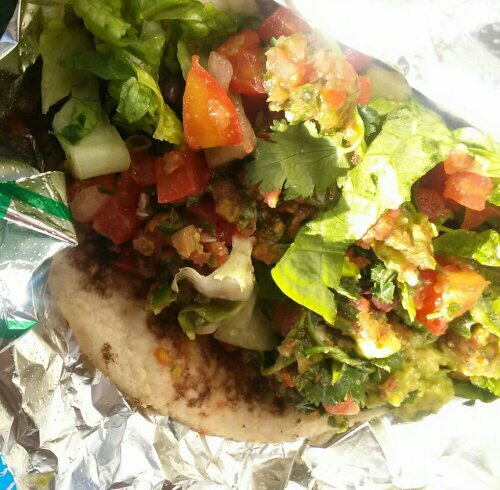 Vegan Mecca) so that should be a whole mess of photos and info and meetups too! Can’t wait! You make me want to visit Denver! It was a pretty good time! But I can’t wait to see you in Portland in a few weeks! Looks like so much fun! I can’t believe you were able to just bring one bag. 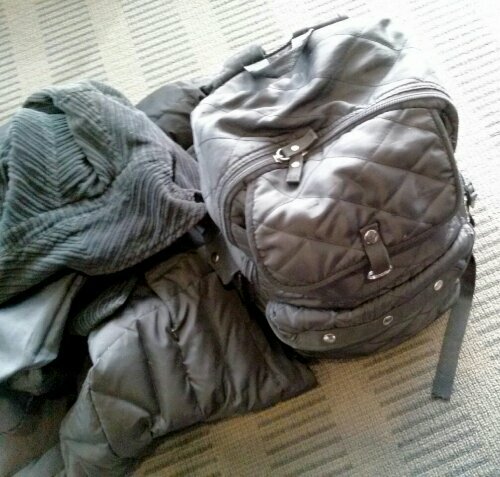 I consider myself a minimalist too but still have trouble packing light. I always worry that I will need X, Y or Z.
I’m going to Vida Vegan Con too! Look forward to seeing you there!